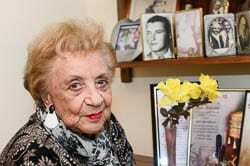 Holocaust survivor Lena Goldstein (nee Midler) has turned 100 today in Sydney. Lena was born in 1919 in Lublin, Poland. She was confined in the Warsaw Ghetto, from which she eventually escaped in April 1943. A biography of Lena Goldstein’s life written by author Barbara Miller, If I Survive, will be launched at the Sydney Jewish Museum on Sunday 10 February, 2.30pm.